Into leather? If you like the feel of the stuff, you might want to consider the new red leather second-generation Motorola Moto X now available from the Moto Maker store. The price of the leather back is the same $25 that Motorola charges for other leather and wood options on the site. 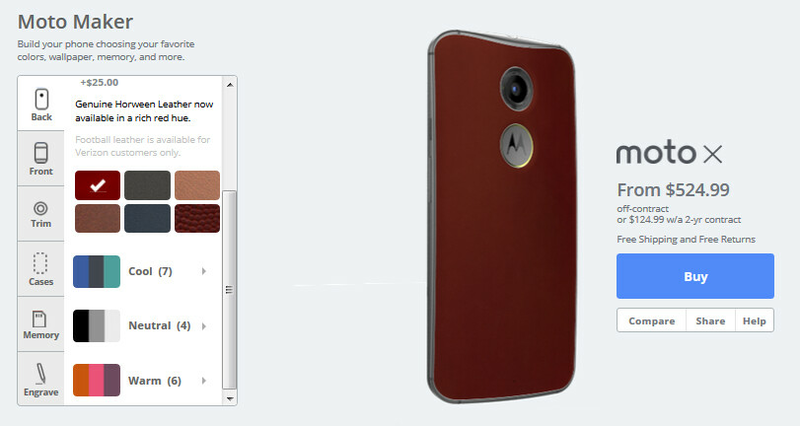 Motorola is partnering with Horween for the material. Let's go over those specs for the second-gen Moto X. The phone carries a 5.2-inch AMOLED display with resolution of 1080 x 1920. That works out to a pixel density of 423ppi. A quad-core 2.5GHz Snapdragon 801 CPU is under the hood with the Adreno 330 GPU crunching graphics. 2GB of RAM is inside and the second-gen Moto X comes with 16/32GB of native storage. Keep in mind that the Moto X lacks a micro-SD slot. A 13MP camera is on back with a 2MP snapper on front for selfies and video chats. A 2300mAh battery keeps the lights on and Android 5.0 is on board. The off-contract version of the Moto X with the red leather back is priced at $524.99 for the 16GB model, and $574.99 for the 32GB variant. If you sign a two-year contract with Verizon or AT&T, the 16GB model in red leather will cost you $124.99. The 32GB variant will run you $174.99. Ah yes, thanks to the leather back there is nothing like that new smartphone smell. I'm not really into leather, but that shade of red is awesome. I'm sure it'll look and feel awesome, but I'm just a little curious how it'll hold up over time. That won't fix the bad camera.